Screenshot of my test results from the 23andme.com website. Click image to enlarge. In my last post, I wrote about my decision to test my DNA by sending a saliva sample to the popular personal genomics company 23andMe. I had just received my results and was eager to spend some private time with my DNA. There are two basic areas of 23andMe to explore: health and ancestry -- at least there used to be. Last month, the FDA ordered the Silicon Valley company to shut down its genetics service, declaring it was making marketing claims beyond what is legal. Now consumers buying the test will get their raw genetic data and ancestry information but -- unlike my results -- none of the meaty stuff, like disease risk, individual health traits or drug interaction possibilities. If I had signed up for the new, paltrier 23andMe service, I would not have learned that I have a slightly elevated risk for 22 diseases, including immune disorders like Crohn’s and Lupus. I wouldn’t have found out that I am a fast metabolizer of caffeine, have a sensitivity to the anticoagulant Coumadin, am resistant to the stomach flu, am likely lactose-intolerant, and that my IQ was likely raised 5-7 points because I was breast-fed. …What if those of us with Crohn's could sequence our gut bacterial colonies? ...Would this be something others here might consider? I think between my 23 and me and uBiome testing it will give me a lot more data to work with in actively managing my health care. I may have to be pushy about it though. My old Doc was excited to have somebody that wasn't a passive consumer of doctor services and instead researched and discussed data and courses of action in managing health care. There are hundreds of forums on 23andMe, each buzzing about shared traits, mutations and tendencies. Is there an identifier for Spasmodic Dysphonia (vocal cords) or Blepharospasms (eyelids)? I have Spasmodic Dysphonia and my mother and older sister have blepharospasms… How do I find out if my children have this gene? There’s nothing new about people getting together to compare notes about their health. We all look to those around us to determine whether we’re OK -- whether whatever symptom we might have is normal. I realized these forums were, at least in part, support groups. But many of these people – who spanned age, gender, race, and location -- were connecting based on extremely specific health concerns for which they often had no symptoms. Clearly, people were striving to connect the dots of their health, and maybe to find some comfort from people whose genetic makeup was similar to their own. I wondered if these nests of speculation were where a genetic counselor might fit in, particularly for those who were sick. Would some of these people seek medical treatment based on some combination of 23andMe’s reports and their conversations in its forums? The U.S. government is asking the same questions. The FDA challenge may hurt the personal genetics industry in the short run. No traits, no health risks -- no fun. But the company is still allowed to show ancestry results. In fact, there was a message glowing green in my 23andMe Inbox. A relative would like to make contact with you. Through our shared DNA, 23andMe has identified us as relatives. Our predicted relationship is 5th Cousin, with a likely range of 3rd to Distant Cousin. Thank you for your time and I hope you'll be interested in sharing genomes! So. If I were to “share genomes” with this relative, a heredity buff of Norwegian descent whose pedigree, he went on to say, was posted elsewhere online -- what exactly would that mean? What exactly would I be sharing – my entire results or just select information? How would this be similar to friending a distant acquaintance on Facebook, and how would it be different? I clicked on a tab that produced a shocking list of 972 distant cousins, ranked by their genetic proximity to me via maternal haplotype. Depending on how much personal information these cousins of mine had submitted to the site, I could see their birthdates, places of origin and residence, names and sometimes photos. They were young women, old men and everyone in between. If I chose, I could expand my family by nearly a thousand with a few clicks. Shown as colored dots on a map of the world, the multitude of my relations was even more impressive. I found familial hotspots in New England, old England and Ireland, Central and Eastern Europe, Sicily, Scandinavia, North Africa, even a few odd cousins scattered in the islands. None of us are really that far apart, genetically, and the map offered a glimpse of the movement of people across the world. The more people who joined 23andMe and shared their genomes, the more comprehensive a picture we could form of a global family tree. A day might come when I would know precisely how related I was to, for example -- you. As I explored 23andMe, I enjoyed reading what other people thought about their ancestry and health. So it might sound selfish when I say I still didn’t want to become friends with them, much less relatives. Our kinship was about our fascination with and curiosity about our own bodies and roots, not really about each other. Here we all were, gathered to celebrate the miracle of this new kind of self-awareness we’d purchased for only $99. But increasingly, I’ve found that I share in concerns about giving away my most personal information to a private company based mostly on the assumption of its benevolence, a la Google, and that I didn’t want to share my genes with my new online brethren. 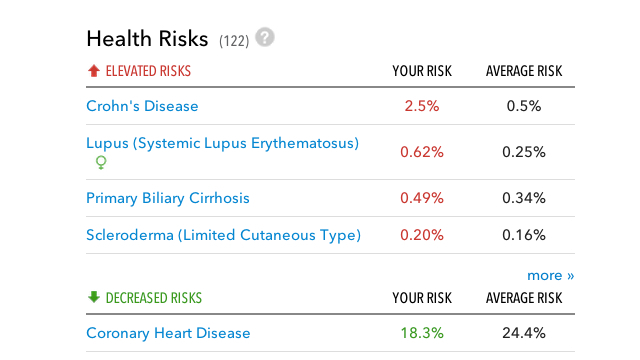 This week, as the company continues to negotiate with the FDA behind the scenes over the rights to market its genetic health data, I realized that at least for a brief time, I’m one of a select group that can still log in and peruse my genetic health risks and traits online. But if I have access to the 23andMe’s studies and predictions, shouldn’t everyone? I suspect that snatching away access to this data has only fanned the flames of our curiosity. In this context, 23andMe’s results feel less like a diversion and more like something we have a right to explore.